They should put shopping here, shirts, shoes and more, they will get more stars if they introduce this. It’s way more easier. The idea is pretty cool. There are many company’s doing these rewards programs now. Some are much better than others. 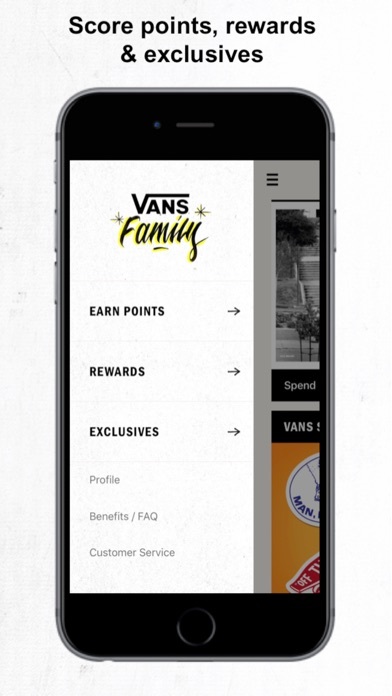 I have a couple issues with this program... First: Vans stores do gift with purchase giveaways (not anything connected to Vans Family). Usually it’s spend a 100$ in the store and you get a free gift. THOSE gifts are usually pretty cool. Bluetooth vans speakers/vans blanket/etc. All of the gift with purchase items I have received are better than what I get on the Vans fam app and some you have to spend much more than 100$ to get enough points to receive. 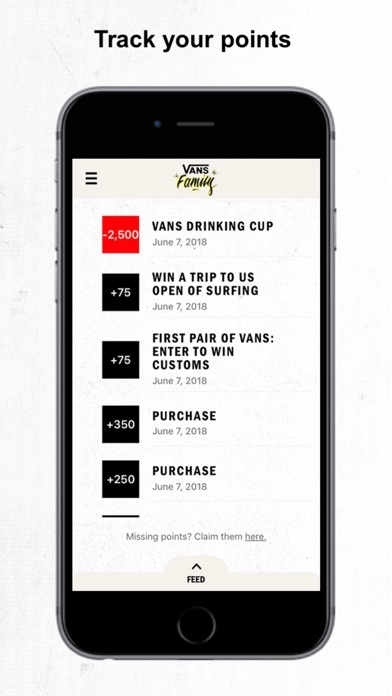 Second: All of the reward items are geared toward people that spend very little in a Vans store or do their little surveys within the app. Having those rewards is fine, but there isn’t anything special for people who spend high amounts at the store/online. My points balance right now is like 25,000.. and I’ve spent points on everything I want on the app. I just have all of these points with nothing to spend them on. This app could be greatly improved if there were higher end items that people could cash in on. To me, if you want this program to grow, you have to push new content out on it multiple times a week, and offer higher end prizes for people to have an incentive to keep getting points. I could literally rant on this for hours, but I feel this achieves the frustration release I needed. All this frustration with this app, and I have to say that I love vans. I always have and will. Skater for life. Vans till death. I just wish this app was as rad as their shoes/history. I like that app but I wish you could do what you can do online far as in creating custom bans or even ordering a pair of vans. When I first got the app that’s what I thought you could do but it’s really only for keeping up with your points and using your points. Please add that to the app. The app should correlate to the online website. This app is awesome. For all the haters and simpletons out there, you can shop and track orders on the Vans.com app. Duh! 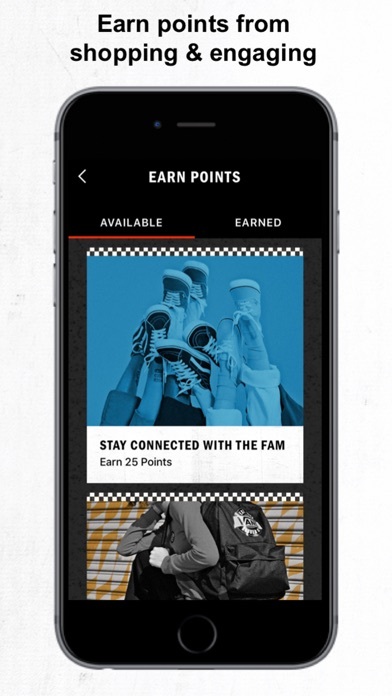 I love vans and all but the app glitches a lot when trying to earn points. Love this app though. Every single time I try to login to my account it always says there’s an error and that’s it’s not working right now. The app won’t let me login even though I made an account. I put in the user ID and it’s still not working. This app is getting 1 star because it is poorly designed. I am trying to search up merchandise, but the whole app is revolves around a point system. And makes it impossible to search for stuff. This app is awesome for Vans lovers.... you can get free stuff for spending a little time answering questions about your vans experience! I would highly recommend it! when i first got this app i figured there’d be an area to let you shop. since vans is a pretty big show company, there should be a shopping section. i immediately deleted the app once i figured this out, i find it to be nonsense to have an app like this. i’d only download it again if i could actually look and buy shoes. i love the app... great to get points but i wish there was a place to shop while in the app!! I really like this app, responsive and put together. I especially enjoy the idea of providing individuals with incentives for creativity. (Submitting photos for earning additional points) However I am disappointed that there’s no option for shopping or tracking orders. It would be incredible to put a pair of pants, some Sk8 Hi’s into an online shopping cart and be able to purchase with my thumbprint. That would change the game. Can you buy shoes on here??? As an eager consumer, I am extremely confused right now. There are so many brands out there that have apps for the sole purpose of shopping for their products, is Vans confused? What is the point of creating an entire app if it lacks even the most basic features that would allow consumers to quickly and efficiently order products, really upset that I even downloaded this app. Fix it. We need to be able to shop on this app, please! It would be really helpful&handy. I love Vans. I have 10+ pairs of them and am not planning on stopping my collection. I would love to be able to shop through an app. Hoping for it in an upcoming update. Fingers crossed. I love Vans! I wear them almost everyday; although, I wish the app had an update where you could shop and track your orders. I downloaded this app as a quick and accessible way to track my purchases and add items to my favorites for future purchase, but I was disappointed to find out that this was not the intense use for the app, an update with those added features or maybe a new app would be great! I already have an account and was excited for the app. However when I go to sign it it won’t let me enter my first or last name. The app is great but I should be able to buy vans from here as well. That is all. Point redemption is a huge pain in the behind. If I have to keep calling customer care EVERY SINGLE TIME I have to submit a receipt, I'd rather just not claim it. I’m super stoked about this app, it gives you an incentive for purchasing Vans products! (10 points per $1) Rewards are 100x easier to obtain v.s say, Zumiez Stash which is almost impossible to save up enough points to redeem something worth all your points. 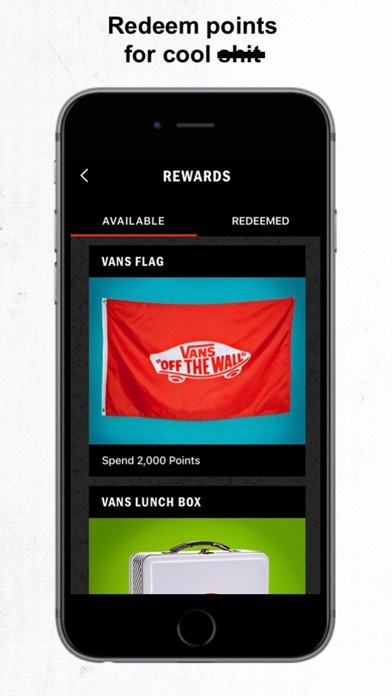 Keep in mind that some rewards have to be redeemed physically in a Vans store. I highly recommend this app, and of course Vans merchandise! 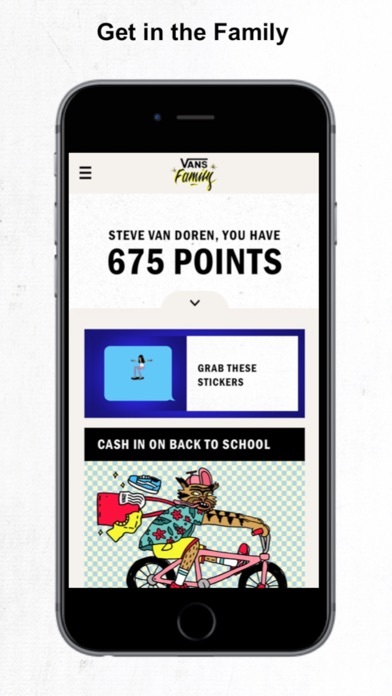 It’s awesome Vans has an interactive app and rewards program, coming from a photo contest winner! After seeing how organized they were in contacting me about my prize, they deserve a review and I never do these.